Bradford’s newest brewery – Northern Monk Brew Co. The rise of the North’s newest brewery – Northern Monk Brew Co.
“It would be nice to be one of the people helping to put Bradford back on the map for positive reasons”, says Russell Bisset, founder, along with brewer David Bishop, of the Northern Monk Brew Co., the city’s latest brewery, and one set to continue a rich history of brewing in the region. “Our sense of place and the ‘Northernness’ of our identity is an integral part of what we’re trying to achieve”, he continues, describing how his fledgling brewery started to shape and take inspiration from the lands around it. 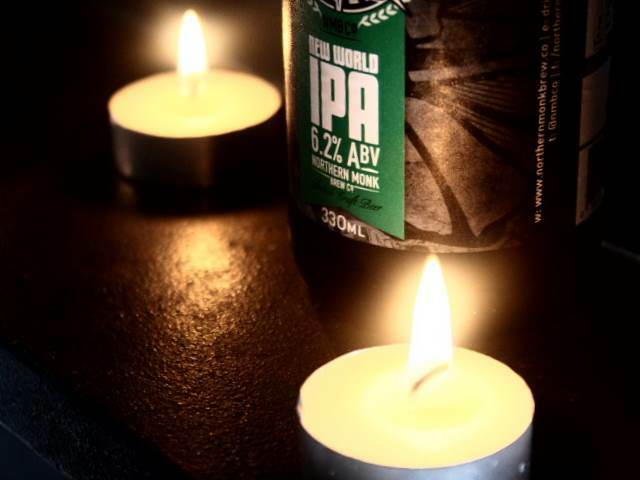 The North is a rich hunting ground for anybody interested in beer, with a clutch of first-rate and inspirational breweries producing some stunning beers across the region, and The Northern Monk Brew Co. continues this tradition with their first beer, New World IPA. It’s a punchy, strident brew packed with the flavours of the New World and wrapped in some mysterious and enigmatic branding that revolves around the hooded profile of a monk, backed against beautiful black and white shots of the best of Yorkshire’s riches of scenery. It’s a compelling and convincing package, but Northern Monk is more than just good branding and a decent beer. “The dream is to have a fairly accessible site for the brewery whether that be in the centre of Bradford or the Shipley/Saltaire area, that acts as a focal point for the community”, says Russell. ” It would be fantastic to see this lead to collaborations with other businesses whether this be music, food, art, or education”, he finishes, before describing some of the collaborations with local writers, cooks and artists that the brewery have engaged in so far. It’s an interesting and vital approach, and one that nods back in time to the way that brewing monks – the masters of the craft – enjoyed a place central to their communities because of the quality of the beer they produced. Russell hints at the fact that Northern Monk is nomadic, a ‘cuckoo’ brewery that rents production time in other, established breweries – a sensible and practical ‘start small’ approach to the risk involved in setting up any new business, but especially one that demands colossal investment in equipment and premises, as setting up a brewery does. Regional neighbours Saltaire Brewery have recently announced a six-figure investment in plant to increase capacity at their Shipley brewery, which gives some indication of the investment required. So, best to learn, hone, improve and invest in infrastructure when the time is right. There’s a tendency among some beer aficionados to dismiss cuckoo brewing as somehow less committed and more commercial, but this narrow view overlooks Northern Monk’s origins in the minds of a couple of experienced homebrewers, well used to producing consistently good beer from their own kitchens, Russell taking a slightly left-field approach, and, by his own admission, making it up as he goes along, against David’s more structured and progressive approach – it’s that structure that brings with it the ability to reproduce beer in a consistent way. David’s adventures in homebrew are well documented on his excellent blog, and his beers have been fantastic. I’ve tried a couple, although there was once a moment of confusion when I said that a lovely smooth porter should go straight in a pan with a load of beef brisket and onions … David seemed to take that for a second as meaning ‘it’s only good enough for cooking’, where I meant it as ‘it’s definitely good enough for cooking’, because what’s the point of braising something as wonderful as beef brisket in anything but the best stout or porter? It’s hard to criticise an approach to setting up a new brewery that seeks to manage the progression from enthusiastic amateur to early professional brewer in a controlled way. It isn’t a question of commitment, it’s a question of intent. “It doesn’t really matter how you brew the beer, providing you have the right motivations and approach to doing it” . It’s great to see people with drive and determination, willing to tread a new path and start a new venture. It’s equally good to see that venture so grounded and so well-received. I called into Saltaire Wines the other day, to find New World IPA centre stage on the rack by the door … there were only a few bottles left, sat sadly in a big open space on the shelf that had clearly been packed with beer. “It’s been flying out”, said the bloke behind the counter, and I can understand why … “someone sending you an email to say they loved the beer, rating you well on one of the many beer rating websites, or coming and complimenting the beer to you in person can make your day”, finishes Russell. He’d best get used to those emails. I look forward trying their beers. Hopefully they will bring Bradford on a map for a positive reason (food/drink wise). Unfortunately for me it is a city where old mutton goes from my local farmers, so I don’t associate Bradford with good food/drink industry. I have met guys from The Bad Seed Brewery based in Malton few weeks ago and I believe this is one of the newest North’s breweries too. 🙂 I think they have been trading for around 8 weeks now. 🙂 Do you know their beers? I would recommend their Espresso Stout and Saison. I am not a fan of Indian pale ales in general, so I can’t really judge the other beers.